Tor Burns is a noninfected vampire committed to saving his diseased comrades from certain death at the hands of the Vampire Council. He is the meanest, strongest, and most impulsive member of the team with a new purpose: guard the irresistible daughter of their fallen leader, even if it means having to cast his attraction aside. Allison Tack is an infected vampire and a walking target wherever she goes. She wants to learn how to protect herself, but no one is listening, so she sets out to prove that she can fight alongside the best of them. The harem leader, Melissa, is determined to discover her son’s fate. Time has made her desperate enough to wage war against Tor’s group, not realizing that she has fallen into a trap. Tormented by his past, Tor must decide between paying the price or risk losing the woman loves. *Many trilogies suffer from “sagging middle syndrome.” That is not the case here. In fact, I would go so far as to say book two is a good deal stronger than book one. It’s grittier, has more action, and no fade-to-black scenes. *I should add here that Ms. Font has drawn her line in the sand; The Gates Legacy is an adult series without question now. Not so much in that its graphically explicit in its descriptions – its not – but it does delve into well-written situations from intimate moments (Can we get a whoopi cheer for Ally & Tor? Those two definitely needed it!) to mayhem and murder. 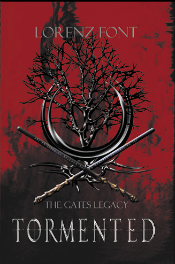 *Tormented is an amazing follow up to Hunted. I have to say that this Vampire world keeps getting better and better as we delve into the crux of things. There is so much going on and beneath the secrets and the lies when things come to the forefront all hell breaks loose. *This book is a beautiful installment in what is proving to be an amazing series!